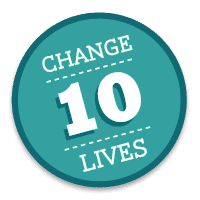 change 10 lives. in 10 days. Could anything be simpler? And it’s true. You and I have the power to change 10 lives over the course of the next 10 days. I have partnered with The Mission List and Water.Org to raise awareness of the unimaginable water crisis facing much of the world today. An American taking a five-minute shower uses more water than the average person in a slum in a developing country uses for an entire day. There are parts of the world where the average person (usually women and children) must walk almost 4 miles for water. As I write this, more people have a cell phone than a toilet. Which is why I am so proud to use my voice to not only bring some much-needed attention to this worldwide problem, but to DO SOMETHING ABOUT IT. Only $25 brings one person water for life. For the next ten days I will be trying to raise enough money to help change the lives of ten people. And I’d love for you to join me. Donate to my fundraiser, start your own fundraiser, or just learn more about the water crisis. Thank you so much for taking the time to consider how much good we can accomplish. Together. Would you like to read posts by some of my talented fellow bloggers?